With PSD to WordPress, you get a fully functional WordPress theme that is ready for you to upload. It is an effective and popular web development technique. And, with this conversion, you can get a unique & robust website that can help you in growing your business rapidly. Nowadays, nearly most of the WordPress websites have come online? To stand out from the crowd, you need to create unique WordPress website. To get the uniqueness in your WordPress site, you should own a PSD design or get it designed from a reliable web designing agency. Further, you can opt for PSD to WordPress conversion services. 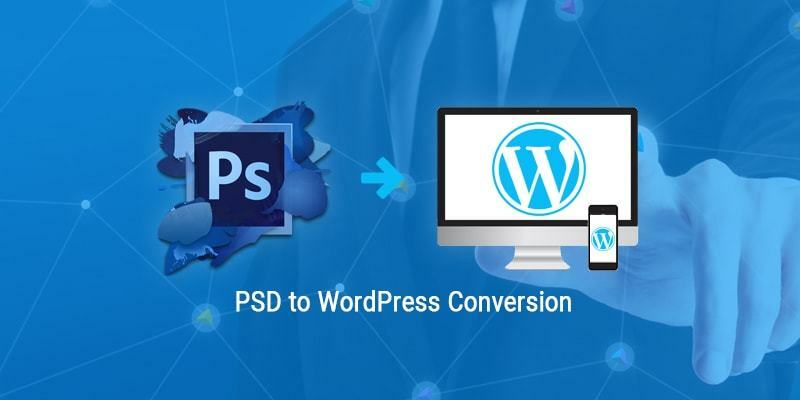 In this blog, we will describe the some effective steps of PSD to WordPress conversion. After reading all the steps, you would be able to know, how you may convert PSD template to WordPress theme. And, how PSD to WordPress conversion is important. Photoshop document (PSD) is basically created by Adobe Photoshop. It is a layered image file that allows the user to save the file and edit part of the images into another file format like JPEG, png, etc. In this workable file, the user can create their own design. For designing, you need to open this file in a photoshop document. Here, you can perform edit operation. If you have flattened the PSD image then it cannot be converted back to PSD. So, make sure, do not overwrite the PSD file during conversion. Basically, the website depends on the two things, first is designing and another one is content. But, the content is independent thing which describes the website. To give a look at your website, you need to use a WordPress theme. WordPress theme provides the overall styling of your site. It includes front-end font styling, widget location colors and page layout of your site. These are available premium and free as well. If you use premium WordPress theme then you will get reliable code and support as well if anything goes wrong on your WordPress website. Why should you choose PSD to WordPress Services? How to perform PSD to WordPress theme conversion? There are thousands of prebuilt themes available on WordPress which you can use to make your site attractive. But, if you want to create your own design to show yourself unique, you need to transfer the picture design to a website. This conversion may get tough but if you follow the below steps then it can be quite easy for you. As we know, PSD contains the part of the images. So, you need to cut the PSD design in slices for converting PSD template to WordPress theme. After that, through photoshop design, you can save each design component into a different file. For cutting your PSD design images, you can use any editing software. Now, you need to separate all the images that you want to include in your webpage. Do not upload more images, it will slow the performance of a webpage. You can also arrange your images by the use of slider, header, footer and background framework. Maintain the quality of the each image while cutting them. If you want to create static web page then you can use HTML and css file. Thus, it would be more helpful for you to know something about HTML and CSS. In this step, you have to move on the programming phase. You need to create an HTML and CSS file for webpage coding and designing the code. You can rename the HTML file by home.html and css file by Stylesheet.css. To save the file name, you can use some tools like notepad or use some programming editor like Dreamweaver. If you are interested to learn to the code of HTML and CSS then you may go for any tutorial site to draw the perfect web design. Now, put the sliced components into the correct positions by using index and CSS file. For this, you need to open the editor. Here, you will have to create a file and name it by Home.html. To save CSS file, open another editor and named it by stylesheet.css and then save it. If you want to write the basic code of header body then open the html file. Do not forget to use the proper references of class while creating any tags. So, you can easily connect to your CSS files. Finally save the html file. The main reason is to convert a PSD file to WordPress is to create a user-friendly website template that can be uploaded easily on the WordPress dashboard. Once you convert PSD template into WordPress theme then you need to upload it to the WordPress dashboard. But, before uploading on a WordPress dashboard, you need to know a little bit about WordPress. There is a specific file structure in WordPress which you need to follow. There are two files which you can use to create a WordPress theme, first is the index.php and another one is style.css files. Although WordPress has many other files like footer.php, archive.php, header.php, sidebar.php, and so on. You may also use any of this file according to your choice. Basically, you are going to upload your own web page to WordPress themes. You may add WordPress plugins and extra other functionalities with it to make more authentic. Index.php: It represents the homepage file. Header.php: This file is used to define the common header design for all the webpages. Footer.php: You may add common footer for all the pages. Category.php: By this page, you may display all the categories. Tag.php: If any tag is required on the website then you may use this page. Sidebar.php: With this, you may create a common sidebar that will fit to all the pages. After fitting the code into the file, you need to download the theme according to your choice. Now, upload this theme to your hosting panel. There is already a default design present in the website. Now, you need to open the index.php file and replace the code with home.html file. After that, you will have to open the style.css file and replace this code with stylesheet.css. After that, you need to click on the save option to save the file. Now, check the design of your website. Here, you can do any change in your design and code. By using WordPress tags, you have to import the predefined functionalities provided by WordPress into your WordPress theme. Here are some links available by which you may access the WordPress template tags. Through this tag, you can get all the details and know how to use these tags in your PHP files. You may add some advanced functionalities that are provided by WordPress. You may see all the tag and functionality under these pages with sample usages. After that, it will be a little bit easy for you to create your own themes. After adding all the tags and new functionalities, you need to place all the files into a single folder and rename it by your name. Now, place this folder inside the —-/wp-content/themes/ folder. After completing all the steps carefully, you may initialize your WordPress theme from WordPress dashboard. Now, go to your new fantastic WordPress website. The complete process of converting PSD template to WordPress theme is quite simple if you follow all the above steps carefully. However, if you face any issue while using this process then you may hire a WordPress developer from CSSChopper. At CSSChopper, you will get an experienced and professional developer who will be always ready for your help. With this conversion, you will get PSD to responsive WordPress website which will help you to get more revenue. Symfony vs Laravel: Which PHP Framework Is Better For Your Business ?